Dogwood or willow branches add height and color to holiday containers, and sometimes they can be an eye-catching centerpiece to a container. Pick a container with clean lines and a contrasting color to the sticks (black, cream), put the sticks in the center — lots of them, if you have them. Then add a fluff of greenery around the bottom of the container. Voila, you have a cheerful holiday container. While red-twig dogwood is the traditional choice for holiday containers, I’ve seen lots of yellow-twig dogwood in nurseries recently and it’s an unusual and fun choice. Of course, dogwood is super easy to grow, so it’s a good option if you want to grow your own decorations. Why not just use a tree (or tree top) in your holiday pot? This nice container has a small spruce tree in the pot, which will be planted in the homeowner’s landscape next spring. With a bow, some artificial berries and mixed greens around the bottom the look is complete. The additions are great, but you could also string lights on the tree for a simple and pretty look. A pair of these (the home in the photo has two) makes a suitably elegant entry for a more formal home. If you have a handsome container or one with an unusual look to it, just add a mixture of greens and call it a day. Many nurseries sell bunches of mixed greens for holiday containers. Or, if you have a large enough landscape and some mature trees, you can harvest bits and pieces from your own trees to create easy holiday containers. 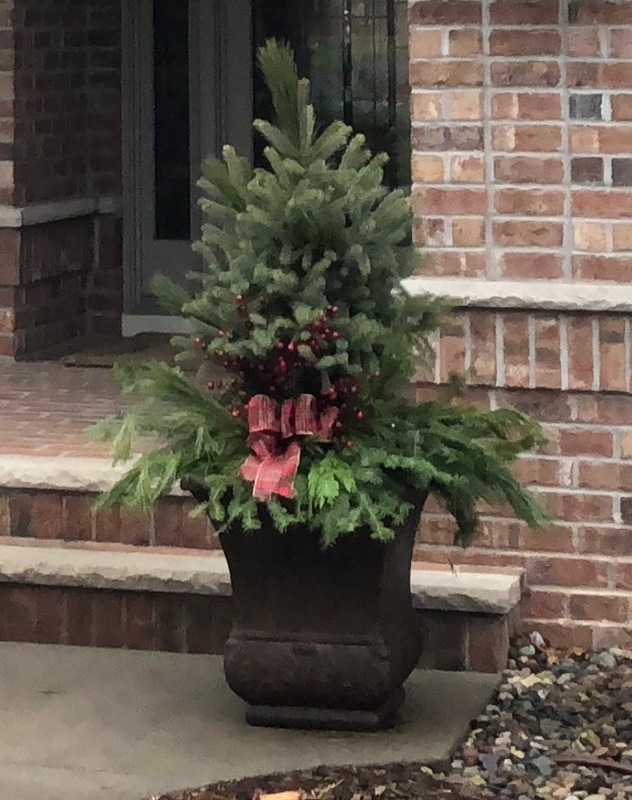 For those who would rather do a container with a variety of elements, check out this post on the correct proportions for holiday containers. Generally, designers recommend you use three to four kinds of greens in a container and two to four extras, such as sticks, birch logs, berries or artificial holiday decor. Whatever approach you take to your holiday container, have fun!